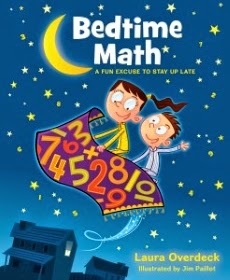 Top Notch Material: Bedtime Math Makes Math and Bedtime Much More Fun! Bedtime Math Makes Math and Bedtime Much More Fun! I have a very smart little man, and his area that he excels most is MATH! I totally do not understand this, because that is the area that was terrible for me in school. While I do not understand his love of math, because the feeling definitely is not mutual, I am glad! I love that he finds math fun, so when I was contacted to review a couple awesome books called Bedtime Math, I knew they were perfect for him! 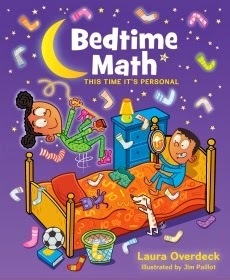 In the spirit of making math as beloved as the bedtime story, founder Laura Overdeck’s Bedtime Math books pair our wacky math problems with colorful, high-energy illustrations to create a book you can cuddle with. Her second book, Bedtime Math: This Time It’s Personal, was just selected by Amazon as one of the top 20 children’s books of 2014 so far. The third book, Bedtime Math: The Truth Comes Out, launches in March 2015, so there’s more coming! Best of all, proceeds from the books come back to Bedtime Math Foundation to support our free programming. Click below to learn about the particular math and mischief in each volume. Every night during out snuggle time, we have been reading a little of these books. I have to admit, even though I am not fond of math, some of the things I have learned in the books are pretty interesting.For example the book gives a little paragraph about a plane, and then there are three options to ask, one for "wee ones," one for "Little Kids" and one for "big Kids," The big kid question in this example was: "if you're flying at 180 miles per hour, then slow to 120 miles an hour to open your parachute, by how many miles an hour did you slow?" My son and I both enjoy the first and second book from Bedtime math, and we are looking forward to the third which should be out in March. We received a few pages from it and it looks just as fun as the first two. If you have a child that enjoys math, or maybe just the opposite, they DON'T enjoy math- you can make math fun again with Bedtime Math! I highly recommend it to parents who want to challenge their child, and get their child thinking at a higher level. You can like them on facebook to stay up to date on the latest goings on with Bedtime Math if you like this concept as much as I do! Thank you for the review. I like that the questions can be geared toward the reader. I will be checking these out as we have been working a bit with our 4 yr old with Math (numbers). We just had the second book from the library. We loved it! The kids really enjoyed testing me with the "challenge" questions!